According to the Meriam-Webster dictionary, Training is “a process by which someone is taught the skills that are needed for an art, profession, or job”. Learning involves “the activity or process of gaining knowledge or skill by studying, practicing, being taught, or experiencing something”. The goal is for training to lead to learning. Specifically, in a Maximo project, we want the goals of the training course to lead to impactful learning where a User base understands and implements the course’s objectives. How is this accomplished? The brief definition of training above gives one clue. 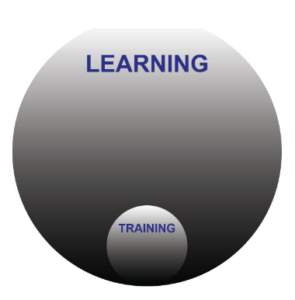 Training is just one aspect of learning. Study, practice, and more are needed. This article continues a series focused on effective Maximo implementations. In the past, there’s been a review of overall factors impacting implementations, the importance of change management, and the need for employee rewards (what’s in it for me?). Clearly, another vital part of a successful implementation is effective Maximo training. A continued theme throughout these articles is the difficulty in implementing a large-scale project such as a large Maximo implementation successfully. For that matter, what is success? I’ll look for others comments on this. A&A is committed to effective training paradigms that lead to real world impacts. This training focuses both on Technical and so called ‘Soft Skills’ topics. So, what is Effective Maximo training? Clearly, on one level, that’s a subjective term. But, there are clearly objective methods that can be used to asses training effectiveness. The most common way is to pass out Evaluations and sum these up. Great evaluations? Clearly the training was effective. Well, not so fast. While this is the most common measure by far, I’d argue that it is one of the least effective assessments of training results. A much better approach would be to follow-up at intervals after training to measure training impacts. Do employees truly understand the capabilities of the system? Are employees using the system correctly? And, is this usage causing a measurable impact on maintenance and asset management programs? For some reason, the training of staff often appears to be an afterthought with too few hours allotted. Think back to your experience attending a training course. Prior to attending, were you made aware of specifically what would be covered? Did you have a clear understanding of why you needed to go? Did the management team clearly enforce the importance of the delivered course(s)? Let’s assume the lead up to training was handled perfectly. The rest should go smoothly, right? Not so fast. Next comes delivery of the course. During the course, did your instructor understand adult learning principles? Was the instructor engaged and knowledgeable? Did attendees actively participate? Study after study shows how little training participants remember from a course. How do we get better retention? Active Learning and repetition are two keys. Oh yes, and hopefully everyone fully understands what’s in it for them. Finally, the course is over. Mission accomplished? Not even close. Now comes support and reinforcement of principles learned. As an implementer, many of us know the importance of a User base using a system shortly after it’s been implemented. Why? Because retention from a formal course is short-term. The User has to begin practicing the new found skill very soon after the course concludes to retain and have access to the learning. There’s so much more to consider for training to be effective. And, again, this is just one aspect of successful implementations. Every step needs to be carefully considered, thoughtfully planned, and thoroughly performed with follow-up evaluations of effectiveness. Giving too little time to any one aspect (pre-install assessments, functional workshops and designs, technical configurations, staff training, follow-up rewards, and more) can undermine the entire project. As always, we’re interested in your perspective. What’s worked when training has gone well for you? What hasn’t worked? p.s. One last thought. When training is conducted, is the entirety of delivered courses focused on the Technical skills? Some consideration for ‘Soft Skills’ training may be in order as well. For instance, many times we discuss people being Change Agents. But, do they truly know what that means or how to be a Change Agent?